Please refer to our stock # 798 when inquiring. 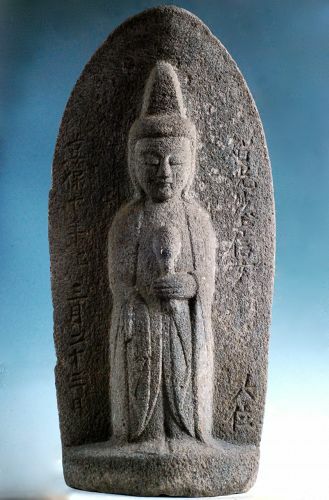 Standing Sho-Kannon Bosatsu, the left hand holding a short-stemmed lotus bud and the right forming the segan-in mudra symbolizing the fulfillment of the historical Buddha's vow to strive for the salvation of all sentient beings, sculpted in bold relief from a gray-brown igneous stone. Clearly dated to the 10th year of the Kyoho Era (1725), mid-Edo Period. Very good condition, with only a couple of points of very minor old loss. Light lichen accumulation. An elegantly sculpted Sho-Kannon clearly dated to the mid-Edo Period, with significant size and in excellent condition. Highly collectible. Stone Nyoirin Kannon Bosatsu Horeki 9 (1759) Mid-Edo Period Stone Standing Sho-Kannon Bosatsu Bodhisattva Mid-Edo 18th c. Stone (Granite) Jizo Bosatsu Bodhisattva Mid-Edo 18 c.